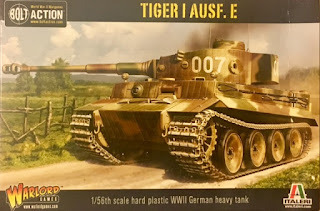 Out of all the World War II tanks the Tiger I was one of the best so when I decided I needed a German tank it was the first one I thought of. It has been depicted in many movies over the years including the cool German tank at the end of Saving Private Ryan which was a (faux) Tiger I. In Fury, the Brad Pitt movie from 2014, there is a Tiger I but it was an actual tank that had been restored making it the first Tiger in a movie for almost 70 years. Plus it just looked cool so I had made up my mind. Also when playing NUTS! 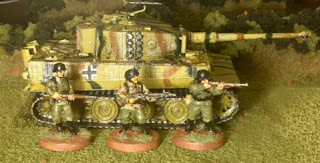 by Two Hour Wargames when allied soldiers see an enemy tank they always panic and think it's a Tiger, that's the kind of reputation they had and since NUTS! is my go to World War II game it made sense to pick it. The few tanks that I have are either plastic or resin, I do have some 15mm tanks in metal but I need a 28mm tank, and since I've had the best luck with plastic that's what I wanted to buy. Since lots of companies have plastic tanks I went with Warlord's Bolt Action tank because I like the minis I've bought from them over the years and also because their Bolt Action 28mm game is pretty popular so it would make sense for them to put out quality models if they want to make money. And it didn't hurt that there were cheaper than I thought they would be so I had my model decided. 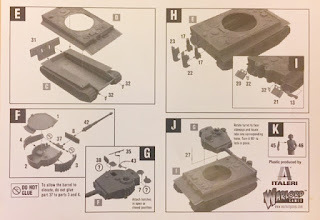 Inside the box, you have two sprues, a decal sheet (which I forgot to take a picture of before I cut into them), a small set of instructions and an ad for other models in their line. So to begin any model you'll want to wash the plastic, which I forgot to do. 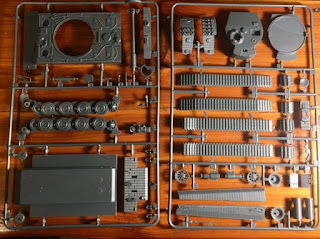 Instead, I began where the instructions told me to, the tracks. I had so much trouble with these things that I rage quit and went back to them the next day. I found a video of someone online building one and realized what had been doing wrong. 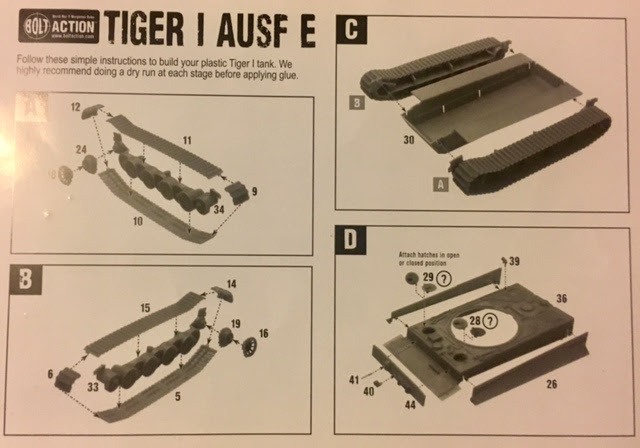 I'm not going to claim that it was all my fault as the instructions were a bit hard to understand. On the instructions box D, you'll see number 40 which I believe is some sight well when cutting that piece off the sprue it launched into orbit and I still haven't found it so I moved on. Now the next thing I messed up was the main gun. You take the main gun (42) and push it into the front plate that it comes out of (8). Well, when I did that I realized it wasn't completely in and looked a little off so I tried to push it the rest of the way and luckily for me I snapped that little bit off the gun into piece 8. I got out my miniature drill and went to work opening the hole on the back of the gun. When done I got out a paperclip and used it to glue the two pieces together and as of now, it's held so I guess it's a win for me. Everything else went on easily and I had a complete model so it was time to move to stage 2, primer. I'm cheap and I use to buy the 99 cents Wal-Mart special primer but sometimes it would spit out blobs of primer and one time I had a real bad blobbing which basically ruined some of the Bobbie minis I had from Empire Of The Dead so I moved up to Krylon primer I think, it's out in the garage right now and I'm not. The "Krylon" spray paint has a really nice nozzle the difference between it and the Wal-Mart crap is like going from driving a tractor to driving a Mercedes. Anyway one light coat to give the other passes something to stick to followed by a heavier coat, but not too heavy or you'll have runs. Once it's completely covered let it dry until you begin work on it again. I think models look great in primer grey. Next stop is the paint shop that I've stocked with Vallejo paints which I switched to after I threw so much money down the drain with Game Workshop paints that would always dry out on me. 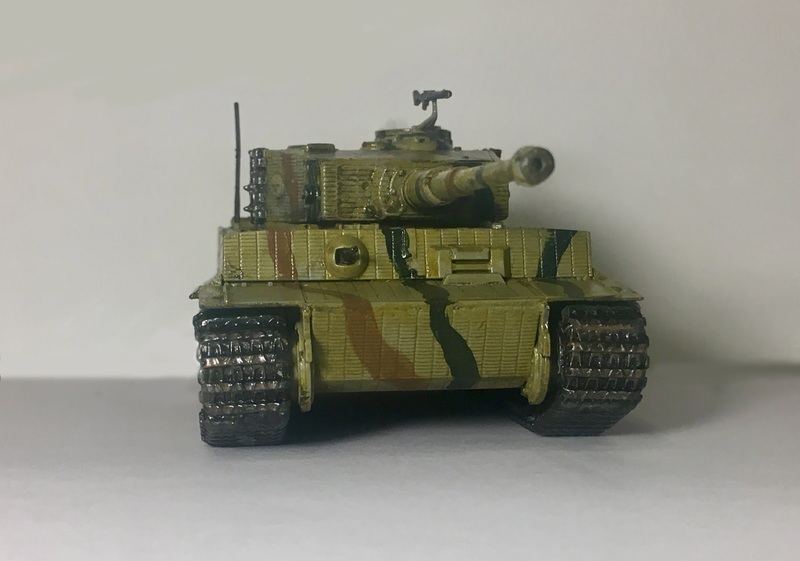 I don't go crazy with painting which is why my miniatures look the way they do. I could be all fancy and use an airbrush but I don't have one. I will say I have started to do some research on them so you never know. 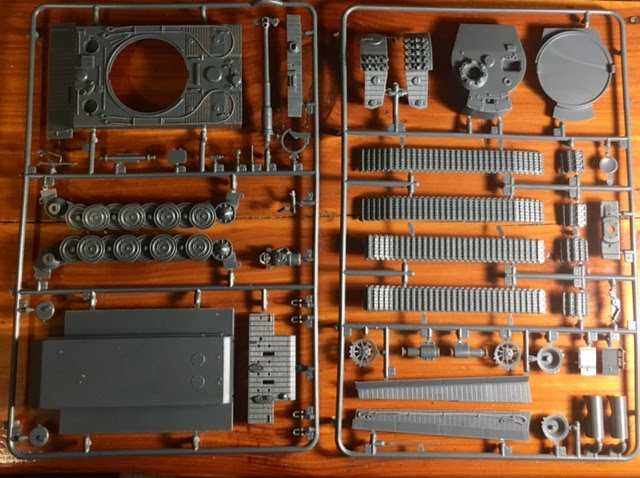 The problem I run into is that if I have money for something, like an airbrush, I'll find something shiny that I could play that's way more fun than a tool and buy that instead. To paint the tank I did the tan color and ran a couple of wavy lines over the tank in brown and dark green. 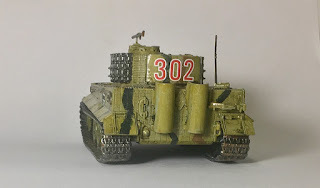 I painted the treads and all the tools on the top of the tank and anything else I missed. I then coat it in my patented wash+ink and go nuts because unless your tank is being driven off the factory floor it's going to be dirty. When dry I hit it with some gloss varnish. When that's dry I apply some decal medium, cut the decals out and apply them. I wanted to put numbers on the sides of the turret too but they were too big so I went with numbers on the back. Once the decals were dry I added some highlights to the tank and sealed it up with matte varnish Once that dried the tank was done. 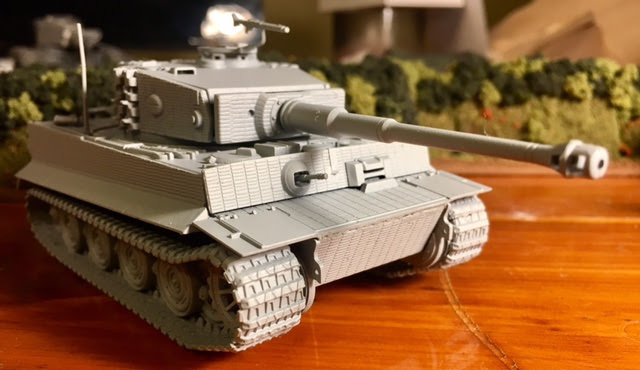 Overall I'm very happy with the model itself and with the butchering job I did to it. As far as a completed model the only thing that for me is going to be a problem is that thin antenna because I know at some point I'm going to break it. Maybe I'll blame it on the Americans or the Brits?